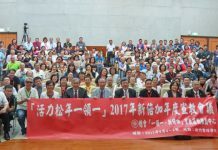 The General Editor of Taiwan Communiqué, Gerrit van der Wees, has been a supporter of Taiwanese democracy for many decades. During a recent trip to Taiwan, Gerrit and his wife Chen Mei-chin visited the PCT General Assembly Office (PCTGAO) and met with past, present, and future PCT leaders, including former PCT General Secretaries C.M. Kao, C.S. Yang, and J.K. Lo, current General Secretary Andrew Chang, and General Secretary-elect Lyim Hong-tiong. 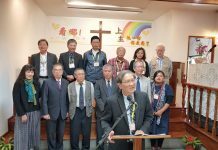 During his presentation at the PCTGAO on March 11, Gerrit gave a brief overview of some of the major stories that the Taiwan Communiqué had covered over the past 30 years. He also gave a brief analysis on some issues that the US Congress has been tracking concerning Taiwan, including US-Taiwan arms sale, free trade agreement, Taiwan’s media monopoly, the Ma administration’s China-leaning policies, the Senkaku/Tiaoyutai Islands dispute, etc. Gerrit also shared his views on the future of Taiwan as a beacon of democracy in the East Asia region. When he spoke about the state of cross-Strait relations, Gerrit said that the current warming of relations between Taiwan and China is a false appearance. He warned that the China-Taiwan relationship will likely grow closer and stronger in the future because China has always wanted to annex Taiwan. However, this rapprochement will in turn lead to more tension between Taiwan and the US. Gerrit suggested that Taiwan consider formulating a strategy conducive to the creation of permanent peace between China and Taiwan. He added that though such a strategy might antagonize people from both sides of the Strait at first, it is nevertheless necessary because it will secure peace for Taiwan in the long run. Former PCT General Secretary C.M. Kao commented that the PCT had issued a statement in 1977 concerning the future of Taiwan and the statement had called on the government to promote a “new and independent country”. This statement, also known as “A Declaration on Human Rights by the PCT”, was issued 37 years ago. Kao said that Gerrit’s presentation is an indication that the problems and demands made in 1977 are still relevant to Taiwan today. Gerrit van der Wees and his wife visited the PCTGAO on March 11.